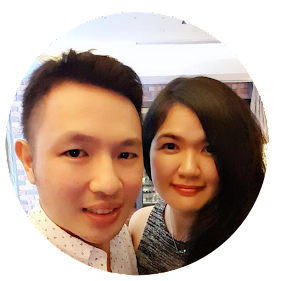 Do not forget to plan a romantic Valentine in 2019 with your other half in the midst of busy schedule during Chinese New Year! 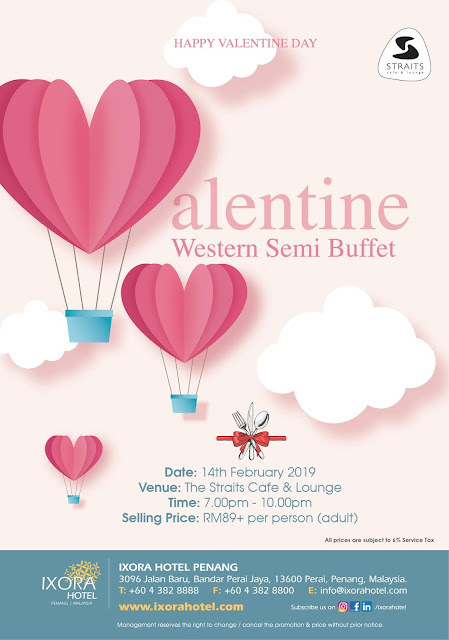 Ixora Hotel in Butterworth has rolled out a Valentine Western Semi Buffet, available on 14th February 2019 from 7 - 10pm. It is priced at RM 89+ per person, and diners can enjoy buffet spread at salad bar, appetizers, cold cuts, soup, then select 1 main course out of 3 choices, Creme Brulee as dessert and enjoy a welcoming drink. 2. Main Course with a choice of Seabass / Chicken / Lamb. 1. RM 100+ for selected bottle house pouring Red Wine / White Wine. 2. RM 25+ per glass for house wine (Red Wine / White Wine). The salad bar features some classic fares such as lettuces, carrots, onion rings, Alfalfa sprout, Enoki mushroom along with Thousand Island dressing, Mango Vinaigrette dressing, Sesame Dressing, Honey Mustard Dressing and Vinaigrette Dressing. Then you can start slow for the night by enjoy bits of Kimchi Salad, Sweet Potato Salad, Tomato & Quail Egg Salad and Squid Salad With Pasta. 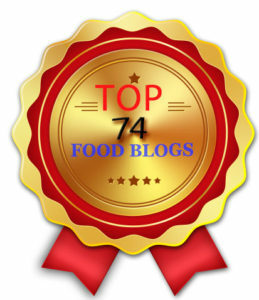 Savour some of the cold cuts here by choosing from smoked salmon, smoked duck, chicken salami and chicken terrine. Do not forget to get a bowl of soothing creamy mushroom soup or spice the night up with soto ayam. For main course, you can get to choose 1 from the 3 available choices, namely Pan Seared Seabass Fillet with Penne Pasta Marinara Herb Sauce, Braised Tenderized Lamb Shank with Creamy Mushroom Potato served with Black Pepper Sauce or Grilled Marinated Chicken Drumstick with Roasted Garlic Mashed Potatoes and Assorted Butter Vegetables served with Orange BBQ Sauce. Last, wash down your palate with creme brulee, and either a cup of coffer or tea depending your preference. The table also has decorated with rose petals to enhance the ambiance for this romantic night. 3096, Bandar Baru, Jalan Perai Jaya, 13600, Perai, Pulau Pinang, Malaysia.